(For lesson plans, see the bottom of this page). 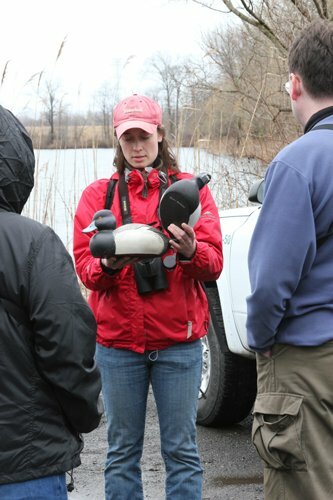 Mercer County’s Tulpehaking Nature Center is the main educational facility for the Abbott Marshlands. Located at 157 Westcott Avenue, Hamilton Township, New Jersey, this building was acquired in 2005 with NJ DEP Green Acres Development Grants to D&R Greenway Land Trust that were matched by Mercer County. It is owned by Mercer County and operated by the Mercer County Park Commission. ‘Tulpehaking’ is a Lenape Indian word meaning ‘Land of the Turtle’. It is a name used for an area near the marsh and the turtle was a totem for one of the Lenape clans. There are many turtles to be seen in the Spring Lake area of Roebling Park. They’re most obvious in early spring when they can be seen sunning themselves on logs, at the edge of vegetation, or near the water surface. Programs and exhibits (in development) encourage visitors to explore and discover the many cultural, historic, and natural resources of the Abbott Marshlands. The nature center’s hours are: Friday and Saturday 10 AM – 4 PM, and Sunday 12 Noon – 4 PM. Other days are available by appointment for programs. For information about the Tulpehaking Nature Center on the Mercer County Park Commission website, click here. 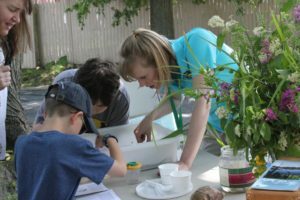 For a schedule of Abbott Marshlands programs including those at the nature center: for a schedule, click on brown pot on the right. Click here for a list of donors for the May 1st Salon Raffle. Money, to the Friends, helps support nature center projects. Center at the Abbott Marshlands. Find Tulpehaking Nature Center as one of the Featured Locations, and click “Find Directions.” Developed with state-of-the-art mapping technology, this site makes it easy for users to plan their routes through multimodal methods — combining biking + walking + public transportation within one trip. Plants as Medicine: Part I (grades 3-5). Appendix (with illustrations) is not yet available as a pdf file. For questions and to arrange visits and/or programs, please call 609-888-3218 or email Kelly Rypkema, nature center manager: krypkema@mercercounty.org.